Losing a loved one is hard in so many dimensions, not the least of which is their absence from our lives. Often, we feel a responsibility to keep the memory of the departed alive after they have left us. This is important during the holiday season—for many, it is a time of family gatherings, of joy and increased spiritual reflection. 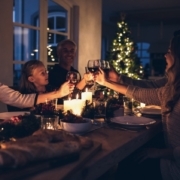 If you experience a flood of mixed feelings without loved ones that often accompanies this time of the year, here are 7 ways you can honor them throughout the holiday season. Did your loved one possess a favorite piece of jewelry, clothing or an item that was special to them? Is there a particular souvenir from a family trip that sparks memories? Whatever it may be, wear it or bring it with you to a family holiday event and use it to invite conversations about how much they are loved and missed and the void they leave behind. Personal effects are powerful in that they are physical manifestations of our deceased loved one’s personality, passion and life well-lived. During prayer or toasts before meals, remember them with gratitude and acknowledge how deeply felt their absence is among those present. And if you find yourself at a loss for words a moment of silence is appropriate here, too. Saying their name in this way allows everyone in attendance to honor and give reverence to their missing loved one either privately or by chiming in. Remember all the good times you enjoyed by bringing out the living memories you have. Use videos and photos to spark conversation about them. Communication is so important when dealing with the aftermath of grief. This activity provides a lighthearted opportunity to those who may be privately struggling this time of year to share their feelings with others. Food plays an important role not only in life but in death. We eat for the nourishment of our bodies and souls often for comfort in grief. Did your loved one make a dish that everyone enjoyed? Make their recipe the focal point of your gathering. The dish will touch on all senses and remind you and others of their time here on this earth giving everyone a chance to pause and reflect. Have everyone who knew the deceased write one memory. Afterward, read them aloud and share in the good feelings. What better way to remember someone than by making them the center of attention for a while? Also, each person’s path or journey with their loved was unique to their own experience. Sharing in this personal way can serve as a catalyst to bring those who remain closer together. Maybe they loved children, or animals, or were passionate about education. Have the family volunteer together in a way that pays homage to their interests, or find a charity worthy of them and make a donation in their name. Doing what you know would make them happy will bring joy to the occasion. Commit to being a good son/daughter, wife/husband, mother/father, aunt/uncle or just a friend. Use the loss of a loved one as a reminder to appreciate what you have and to strengthen and cherish the relationships in your life. There is perhaps no more impressive way to honor a lost loved one than to leverage their memory into being a kinder, more caring person. Doing so doesn’t just keep them alive, it pays their spirit forward. Stuhr Funeral Home, a trusted name in funeral service for over 150 years, honors loved ones and family traditions with their commitment to providing quality funeral arrangements. For more information about funeral services available, visit HenryStuhr.com or call (843) 723-2524.